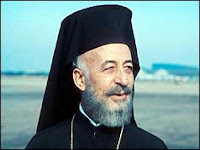 I want to return to the events in Cyprus in 1963-4, i.e. the period during which President Makarios proposed 13 amendments to the dysfunctional 1960 constitution; the intercommunal fighting that followed; the Acheson plans; and Turkey’s threat to invade the island. Regarding the threat of Turkish invasion, this was prevented by American disapproval of any such action for fear it might provoke an all-out war between Greece and Turkey; by Turkey's concern that the Soviet Union would intervene on behalf of Cyprus; and by Turkish anxieties that its armed forces were ill-prepared for an amphibious assault on Cyprus and that any such operation could end in disaster. We note, therefore, that in the early-mid 1960s, mostly because of limits placed on Greece and Turkey by a mutual dependence on America and subordination to NATO interests, there existed a reasonable balance of power between Greece and Turkey. Relations between Greece and Turkey were not as characterised, as they are today, by Turkish belligerence and Greek passivity. What changed, therefore, between 1964 and 1974, to allow Turkey to escape these constraints and overcome its reservations and invade and partition Cyprus? 1. Turkey began to doubt the value of subordinating to America and NATO its foreign and defence interests and started to develop capabilities, relations and a psychology that would allow it to act independently. 2. Although there was a similar movement in Greece demanding that the country release itself from dependence on America, that movement was curtailed, first by the palace coup against the Centre Union government of Giorgios Papandreou (see my post here); and, then, by the colonels' coup in 1967, which initiated a regime utterly subordinate to America. 3. After the failure of former US secretary of state Dean Acheson to secure the partition of Cyprus between Greece and Turkey in 1964, American hostility to Cyprus’ legitimate head of state, President Makarios – who the Americans regarded as not sufficiently anti-communist and personally responsible for obstructing a resolution of the Cyprus problem in accordance with either of the two so-called Acheson plans – intensified to the point of hysteria and hatred and America began to connive at ways to impose the first Acheson plan on Cyprus by force, by persuading Greece to neutralise Makarios and by actively encouraging Turkey to prepare for an invasion of the island. 'Acheson returned to Washington and met [in September] with President Johnson and other top administration officials to discuss a way out of the deadlock… Acheson stated that [the main reasons] a stalemate was reached… were Papandreou's weakness and Makarios' strength. Each passing day, Makarios was becoming stronger while the Turks were becoming impatient. If the situation were allowed to continue in this direction, a violent, uncontrolled Turkish invasion of the island would be inevitable. Acheson and [US undersecretary of state George] Ball argued that the only solution to the problem was the fait accompli of a controlled Turkish invasion of the island. In their plan, the Turks would seize the part of Cyprus which they would have received under the first Acheson plan and then the Greeks and Greek Cypriots would instantly proclaim the unification of the rest of Cyprus with Greece. 'In fact (Uslu writes), Acheson had raised the issue with the Turks during the Geneva talks and had received a positive response. On 4 August 1964 Acheson told the Turkish delegation that he did not advise them to resort to military force but if they did so, America would not oppose them. After the Turks rejected the second Acheson plan, Acheson told the Turkish representatives at Geneva: "I am privately and friendly telling you: Can you invade the part of Cyprus which was reserved for you without causing too much bloodshed? If you can do so, you can invade it. The American Sixth Fleet does not obstruct your way, on the contrary it protects you." Turkish commander General Turgut Sunalp took Acheson's proposal to [prime minister Ismet] Inonu the next day. Inonu rejected it by saying that he could not initiate such an adventure without the official approval of the American administration. ADDENDUM: (1) In saying there was a balance of power between Greece and Turkey in the early-mid 1960s, this should not imply that Greece was militarily or diplomatically strong at the time, only that its weakness and dependence on America was well matched by Turkey's. (2) It is clear that despite the US's failure in this period – 1963-4 – to close down the Cyprus problem by way of partition, America did not abandon its optimum solution for Cyprus, or the method by which it expected to bring about the death of the Republic of Cyprus, i.e. the overthrow of Makarios followed by Turkish invasion. We know this is the case because this is precisely what happened in Cyprus in 1974, on 15 July (the coup against Makarios) and 20 July (the Turkish invasion). What had changed between 1964 and 1974, then, was American diplomacy's ability to persuade Athens (ruled in 1974 by a slavishly pro-American junta) to act against Makarios and its willingness to give Turkey the assurance it had wanted in 1964, that any military adventure it embarked on in Cyprus would enjoy US support.